The Queen Mary Club of Hobart was formed as a residential Social Club for Ladies on July 1st 1910 at 143 Macquarie Street. The building was formerly The Bank of Australasia. The 100 members leased the premises from Hotelier Mr Hadley for 200 pounds per annum. The name “Queen Mary” was granted by Royal Charter. Unfortunately there are no records of the first 19 years of the Club’s existence, the first recorded minutes being dated December 4th 1929. In 1935 the building was bought from the Hadley estate for 3,500 pounds. The Heritage building was designed by prominent colonial architect Mr James Blackburn and was built in 1843. An award was received in 1964 as it was deemed to be the best restored and preserved building on the National Trust Register. 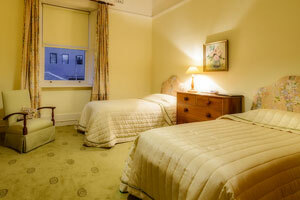 The residential accommodation comprises a twin bedroom and a double queen bedroom, each with shared bathrooms, on the first floor of the main building. The “Mews” is a self-contained unit at the rear of the premises which includes a double bedroom, sitting room, kitchen and bathroom. There is car parking for guests. Please note we do not have a lift to the Accommodation floor. Access is by stairs only. The Queen Mary Club is within walking distance to Salamanca Place where the famous market is held every Saturday. The ferry terminals for MONA (Museum of Old and New Art) and the historic convict settlement of at Port Arthur are also nearby. The CBD, Tasmanian Museum and Art Gallery, the State library and Allport Collection and historic Battery Point are close at hand. Office hours 9-5 Monday to Friday.